I have a couple of Seiko watches and recently decided to revive some of my really old Seiko watches. In reviving I mean to clean up the movement, crystal (as some has fogged up) and case. 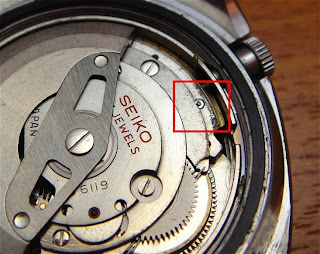 I don't really want to take apart the movement as I don't have the manuals or expertise or knowledge of Seiko automatic movement. 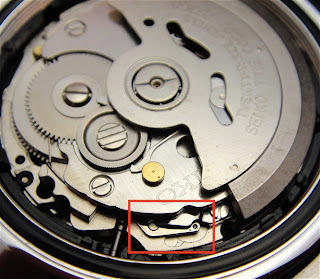 This entry is on how to remove the winding stem/ crown on a couple of the movement that I have. The movements are: 7S26, 7S36, 6119 and 7009. Let's start with the 6119. On the 6119, locate the push piece near the winding stem. Push the piece and crown should come out. It is important to note that on some 6119 movement, the stem may have a gear attached to it. This is to rotate the internal rotating bezel on models that use the 6119 movement and have internal rotating bezel. The push piece is indicated by the red box. Another view of the push piece. Next is the 7009 movement. In this movement, we have to pull the crown out to the time setting position before we can release the stem from the movement. 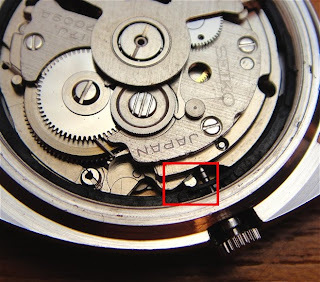 This is because the lever to release the stem is hidden under the movement when the crown is in. The photograph below shows the crown in the 'in' position. 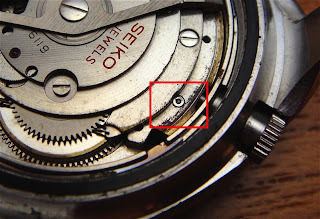 The photograph below shows the crown in time setting position (pulled out). Note the lever in the red box. Press on this lever to release the winding stem. 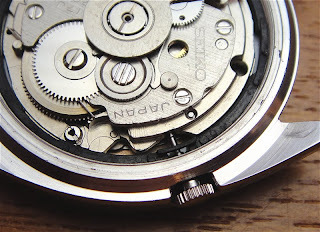 On to the modern 7S26 and 7S36 movement. 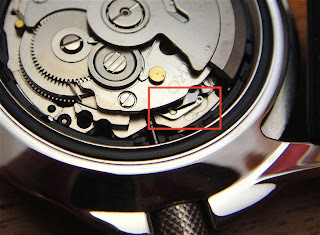 Both the movement share the same method of removing the winding stem. Push on the push piece indicated in the red box and the winding stem should come out. Please push on the 'circle' and not on the lever. Refer to the photographs below. Another view. Note the 'circle' at the end of the push piece. It is important that we be gentle when pressing the push piece. We do not want to damage the push piece or the winding stem. Also remember to press the push piece when inserting the stem. Do not force the winding during removal or installation. Wiggling the stem helps. If it does not go in, take it out and try again. I cost me money when I do it myself... but I just can't stop. hi should the head of the stem break from the stem. Can you still remove the stem out this way or you have to take out the whole clock works?